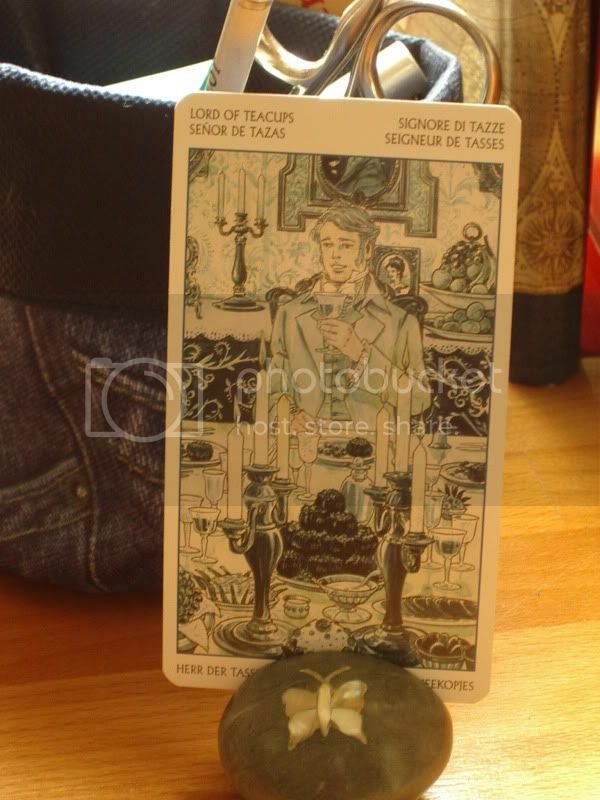 Last Rosh Chodesh (Jewish festival of the new moon) month I have picked the King of Cups from the tarot of Jane Austen, Charles Bingley from the book Pride and Prejudice. My question was what I could renew in the past month. This card rang true on many levels. What I could renew this month was standing more firm on both of my feet. I was easily persuaded in thinking some things were all right, while they were not all right and I was already worried about them. In the end it turned out it was something to be worried about. I should have looked into it with more depth. It were my insecurities that were hindering me (....I am always worrying....so there will be nothing to worry about....), just as Charles’ insecurities allow him to be talked into returning to London believing Darcy and his sisters that Jane is not in love with him. I also see our fair on this card. The lovely table is depicting that. There was the warm and generous atmosphere, the atmospere of the King of Cups. This had lacked the last time we had organized it, but somehow we managed to get it back. Furthermore I was able to meet, talk and read for some of my old and current students and I loved that so much.